You are here: Home / Events / Sept. 17 – Happy Park(ing) Day Pittsburgh! 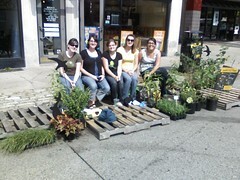 Sept. 17 – Happy Park(ing) Day Pittsburgh! I have been stuck at home all week – fighting off what I hope will be the first and only cold of the fall season. I have been catching up on bad tv and blog reading and one of the events that has been receiving much attention in the blogosphere and beyond – it was actually a friend who I saw on the bus last week that first reminded me about Park(ing) Day. Park(ing) Day is an annual event that is celebrate here in Pittsburgh and other cities around the globe (New York, London, Brisbane, Los Angeles) – where parking spaces are turned into mini parks for the day. Park(ing) day is a chance to see some creative ideas around parks and to think about how we use our public spaces. Over 30 groups will be setting up 25 parks around the city – click on the map for a larger version. Lunchtime Bike Tour of Pittsburgh Parking Day Spots – BikePGH is organizing a lunch time tour of the parks by bike. Click here for full details. The ride will meet at 11:45 and leave at noon from the Bike Pittsburgh PARK(ing) Day Lounge (~410-ish S. Craig St in Oakland). This ride will be slow-paced and no one will be left behind, unless they would like to be. It will be suitable for new riders or people new to group rides, but perhaps not very young kids. If you don’t have time for a 16 mile ride in the middle of the day, why not join for a half hour? We’ll tweet upcoming locations using the hashtag #parkingdayPGH for updates and you can catch up for a segment of the ride. Get your kicks at Kelly Strayhorn Theater’s PARK(ing) Day After Party Extravaganza! Eat, drink, and play games with Obscure Games Pittsburgh outside and in the theater. If you feel the spirit move, then move with the sweet sound of music that fills the theater. Put the breaks on life and enjoy yourself and the company of others at KST! Join the folks at OTB and check out their Reduced, Reused and Recycled Bike-Friendly Pedestrian Park. The park will feature creative installations, interactive Bikerators (bicycle-powered generators) from Kova Enterprises, and more! From 5 pm to 12 am, OTB will be offering the Bike Pittsburgh burger, The Bicycle Advocate, for $5 and East End Brewing’s Pedal Pale Ale for $3. Join Lili Coffee*Shop at their PARK(ing) Day celebration lasting until 10 pm! Park yourself, not your car, at 3138 Dobson Street, home of Lili Coffee Shop, Copacetic Comics Company and Mind Cure Records in the heart of Polish Hill. This location will be the one day/night campsite of The Caravan Collective and Lili’s ’67 Safari and featuring musical performances, grub, drinks, art and crazytalk. AND… Friday, September 17 is also a Car Free Friday – BikePGH has car free events on the South Side and Market Square.